And the moment you’ve all been waiting for… Drum roll please! Here it is! 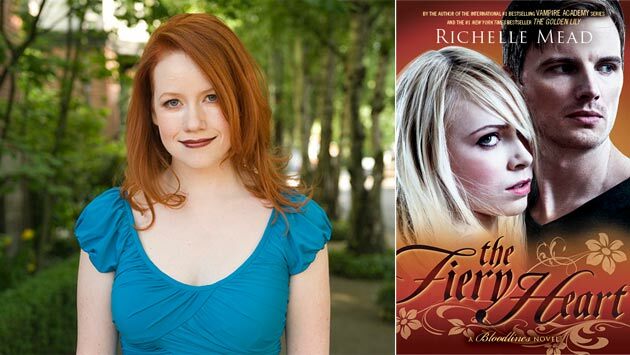 The first book trailer for The Fiery Heart, by Richelle Mead! Nic Wheeler plays our gorgeous Adrian Ivashkov alongside Daisy Masterman portraying the lovely Sydney Sage. I could watch these two make out ALL day! …If that wasn’t so creepy. So, what did you think? And how excited does this make you for November 19th?! Also, check out Bloodlines on Twitter for all the latest info on the series! This entry was posted in Bloodlines Series, Richelle Mead and tagged adrian ivashkov, bloodlines, Book Release, Fiery Heart, Richelle Mead, Sneak Peek, sydney sage, Trailers. Today, Richelle Mead kindly, and rather unexpectedly, shared the second chapter from her upcoming book, The Fiery Heart, the 4th in her Vampire Academy spin-off series: Bloodlines. While news of the 5th book in the series came out this week, the title finally being revealed to be the ever-cryptic ‘Silver Shadows’, we also were treated to the first chapter in Adrian’s POV not too long ago. This one is in Sydney’s POV, and deals with Sydney’s finding out that her parents are divorcing, as well as Sydney thinking about Adrian (who wouldn’t? ), as well as being initiated into her coven. You have you read it to understand it! Fangirl with us on Facebook and Twitter! This entry was posted in Bloodlines Series, Richelle Mead and tagged adrian, bloodlines, Chapter, Chapter 2, Fiery Heart, Richelle Mead, Silver Shadows, sydney, sydrian, Vampire Academy. The Fiery Heart – Chapter 1! What did you think, fangirls? I can’t even… I seriously just can’t… I can’t breathe! How can we wait 4 months?! Fangirl with us over on Facebook and Twitter! The Fiery Heart is due to be released November 19th , 2013. Or pre-order from your local bookstore, worldwide. This entry was posted in Bloodlines Series, Richelle Mead and tagged Bloodline, Facebook, Fiery Heart, Heart disease, Richelle Mead, sydney, Twitter, United States.